Internationally renowned company Northern Ballet delivered free creative workshops at four Primary Schools in the Barnsley area, ahead of their new ballet for children at The Civic in April. Earlier this year, The Civic contacted schools throughout Barnsley to offer a free half-day creative workshop based on Northern Ballet’s new production, Tortoise & The Hare. The response was overwhleming and four primary schools were selected by The Civic on a first-come-first-served basis. These were Hope House and Joseph Locke Primary School, and special education schools Greenacre and North Ridge Community. The workshops aim to give pupils the chance to work with a professional ballet company and learn steps from the production. The sessions included a fun warm up, and explored the story and characters from the show, giving students the chance to try out some of the moves for themselves. “Keisha from Northern Ballet visited our school to conduct a workshop about their production the Tortoise and the Hare which children will attend in April. The children saw pictures from the production and discussed the plot and themes and enjoyed dancing to music in partners, learning routines and expressing their own creativity. The children really enjoyed working with her”. The workshops took place at the schools and were are delivered as part of Northern Ballet’s ‘Short Ballets for Small People’ initiative; to introduce children and their families to ballet and the theatre for the first time. The Civic is delighted to once again programme Northern Ballet’s latest production in the Company’s award-winning series of Short Ballets for Small People, following on from the successes of Ugly Duckling, Three Little Pigs and Elves & the Shoemaker. Tortoise & the Hare is a re-imagining of Aesop’s much-loved fable of a Tortoise who, tired of being teased for his slowness, challenges a speedy Hare to a race. 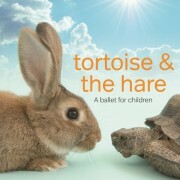 Lasting approximately 40 minutes, Tortoise & The Hare is at The Civic on Tuesday 5 April at 12pm, 2pm & 4pm. Tickets are £6 full price and £5 concessions.